I am thrilled to be a part of the Home for the holidays tour! For the past three years I have enjoyed a tree in our Kitchen. I am blessed to have the room in our kitchen for a decent size tree. A few years ago I used a trunk as a tree skirt,last year I used a galvanized bucket for a tree skirt. This year I decided to use two drawers from my old dresser that is not being used. I just added a little shawl to cover up the stand. This is my Shabby Chic tree,using torn pieces from a Rachel Ashwell sheet I tied together for the garland. And I also took some of those torn pieces and tied them on the branches. 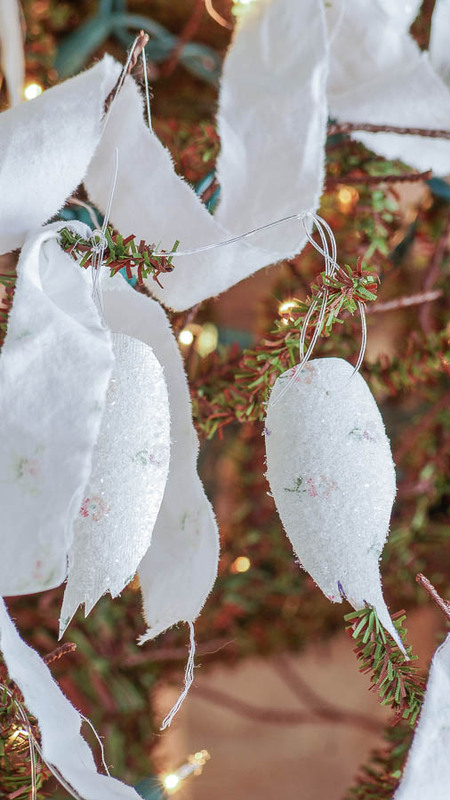 Ornaments were made using vintage wall paper and cut out in Angel wing shapes. Then sprinkled with German glass glitter. I love how simple this is and yet so elegant. On my table I added fresh greens to my zinc bucket. I always have rose’s in my home,always! My scale is one of my favorite finds while treasure hunting. 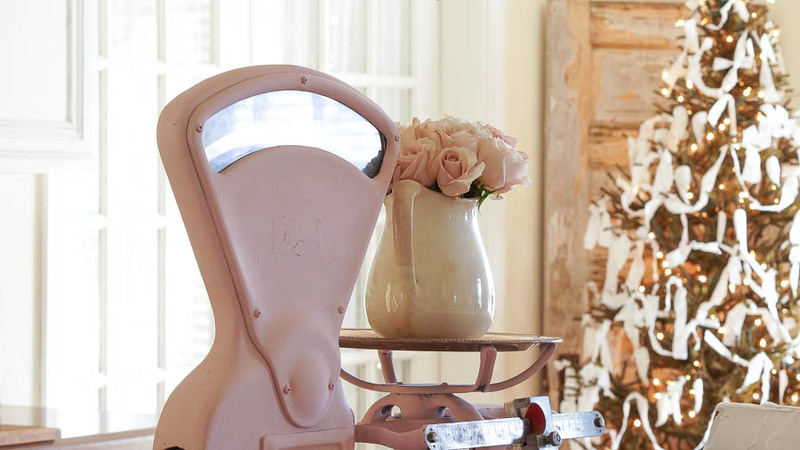 Although I did not find it pink,it was an easy transformation with chalk paint. 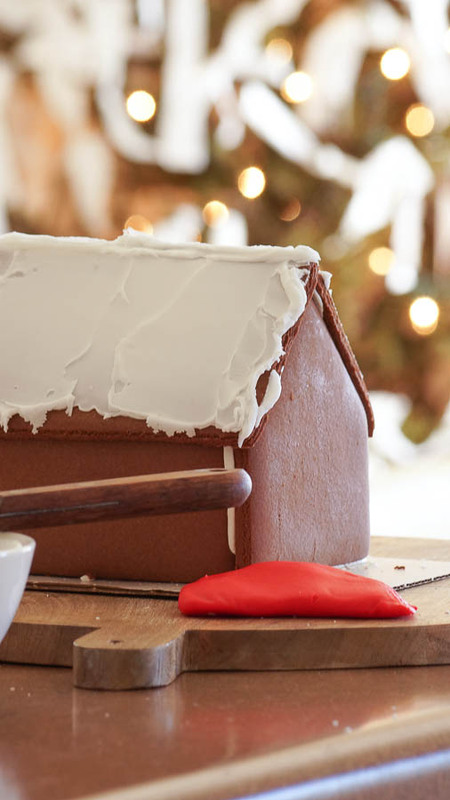 Nothing needs to be complicated when decorating for the holidays. Every year we purchase a pre-made and pre-assembled gingerbread how. It’s always fun decorating and it’s part of our decor. Artificial greens are wonderful to use too. But I really enjoy the scent of fresh greens since our trees are artificial. I am just getting started on my Holiday baking,these are store bought cookies for my photos. But I am making lots of cookies as I always do this time of the year. The good thing for me is that by January I am sick of anything sweet,I just wish I could stay that way the whole year through! I have so much more to share with you,but I am a part of several tours so I am showing a little at a time. And my Dining room HERE. 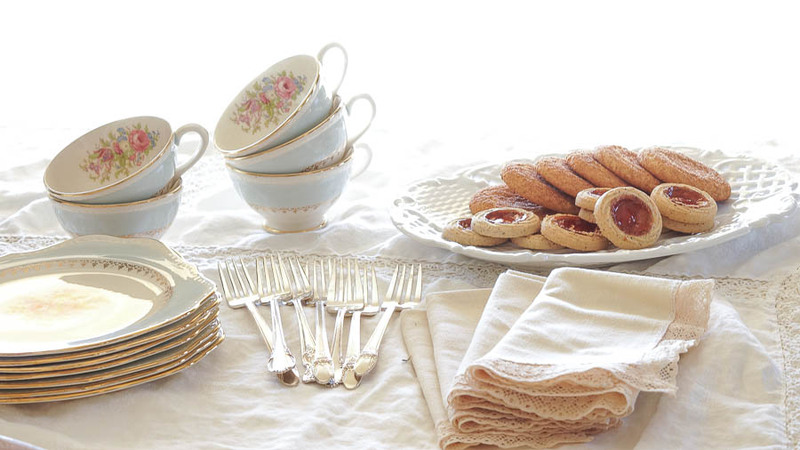 But I invite you to visit all these other lovely blogs! brought to you by Sondra Lyn at Home! 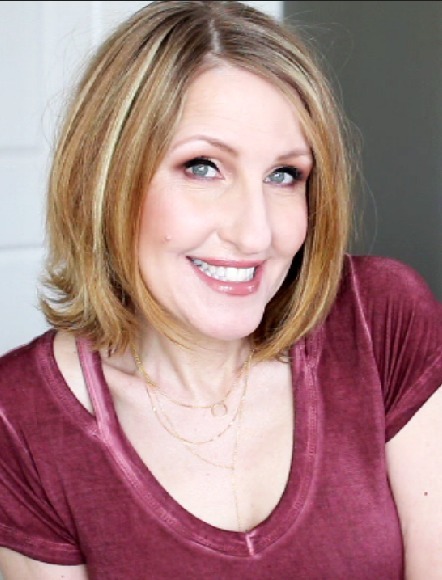 This year’s co-host is Michele from Our Rosey Life. Thanks, Michele! We are so excited to bring the selection of blogs that have been assembled for this inaugural kick-off. Be sure to check back for each day’s inspirational links! Each day you will see new links added for that day’s featured topic. So let’s get started! Enjoy!! Wow, I love the bottom of your tree with the drawers and the lace, sooooooooo pretty! I love how clean and fresh looking everything is! The gingerbread house is looking good too! I love the simplicity and beauty of your tree! Happy Holidays Anne! 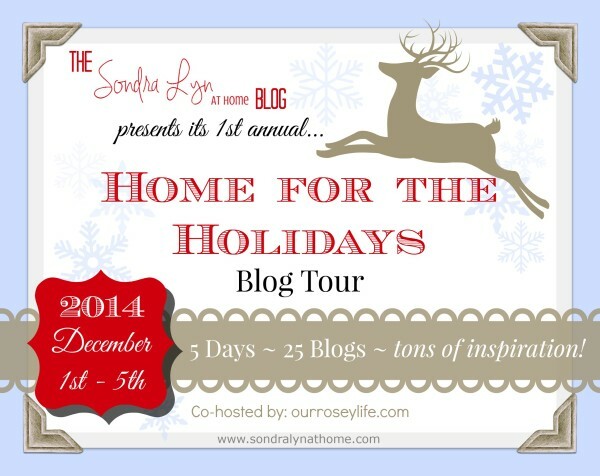 So happy to be joining you in the Home For The Holidays blog tour. I enjoyed visiting. Gorgeous Anne! 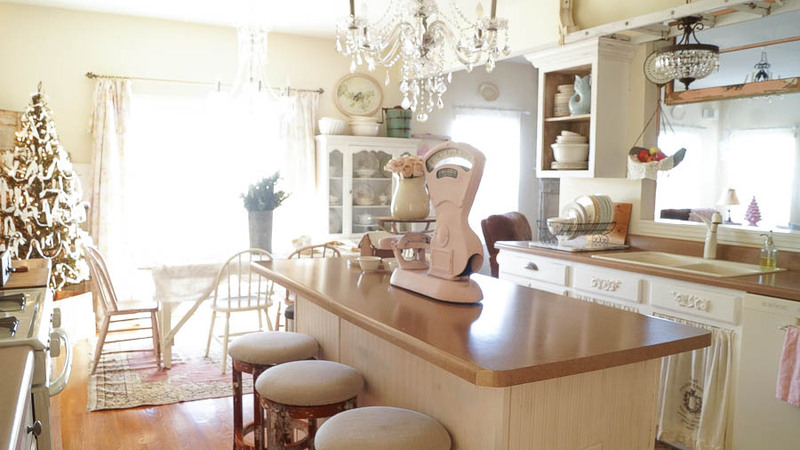 I would love to live in your pink infused home! 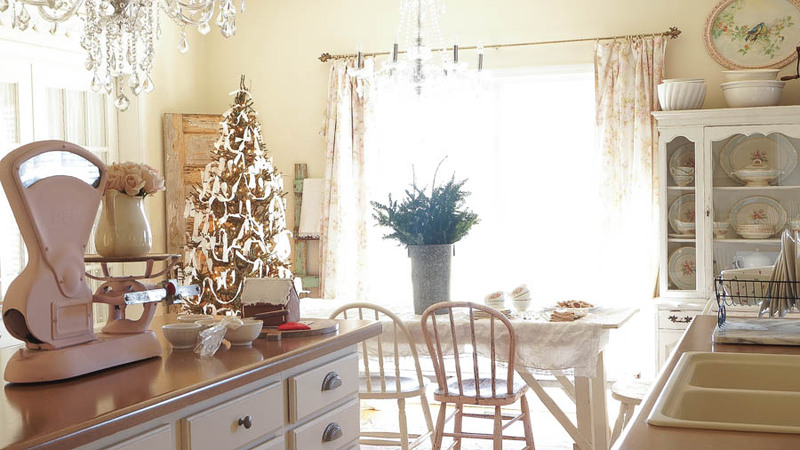 I adore your tree, and your brilliant idea of using stacked drawers as the base of your tree. Amazing, my friend! Your home is just beautiful. Love that tree. I had to smile at it sitting in the drawers. Great idea. I think I could move in and not change a thing. Enjoyed your tour, Anne. Love the tree. 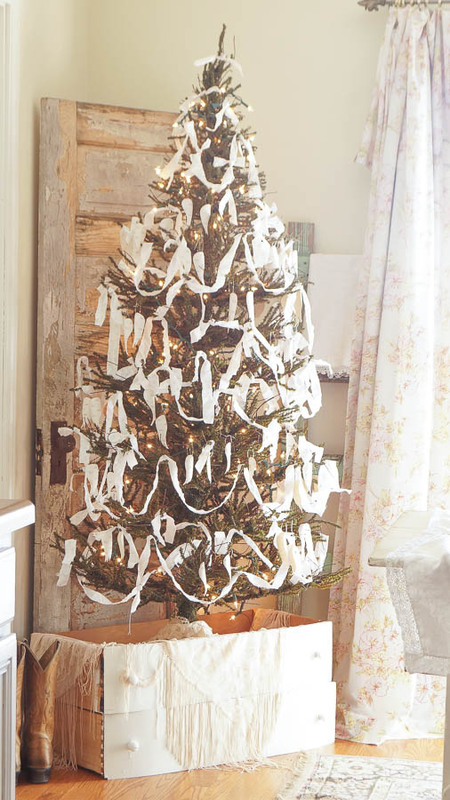 I love how you used torn sheets for your tree décor. I’ve never seen that done before but it has a great look! Setting your tree in stacked drawers is adorable too. You are so creative. I don’t think I’ve ever seen that done before either. Thanks for the inspiration. Anne those stacked drawers as a tree stand was genius!! Everything looks absolutely beautiful! Aren’t you clever to think of using stacked drawers as a Christmas tree stand?? 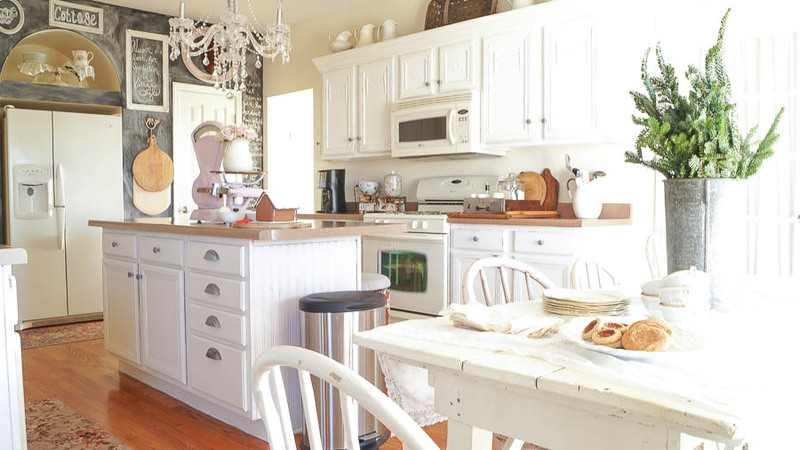 I so much enjoyed getting a peek at your Christmas kitchen. Love Anne. It is so pretty. Love the drawers for your tree. So creative and beautiful. It is all looking so pretty. I will enjoy the home tours. So much sweet inspiration. Anne, I think your stacked drawer tree stand is extremely clever! Your home is always so lovely but it is especially so at Christmas time. Enjoyed being on the tour with you! So pretty Anne! 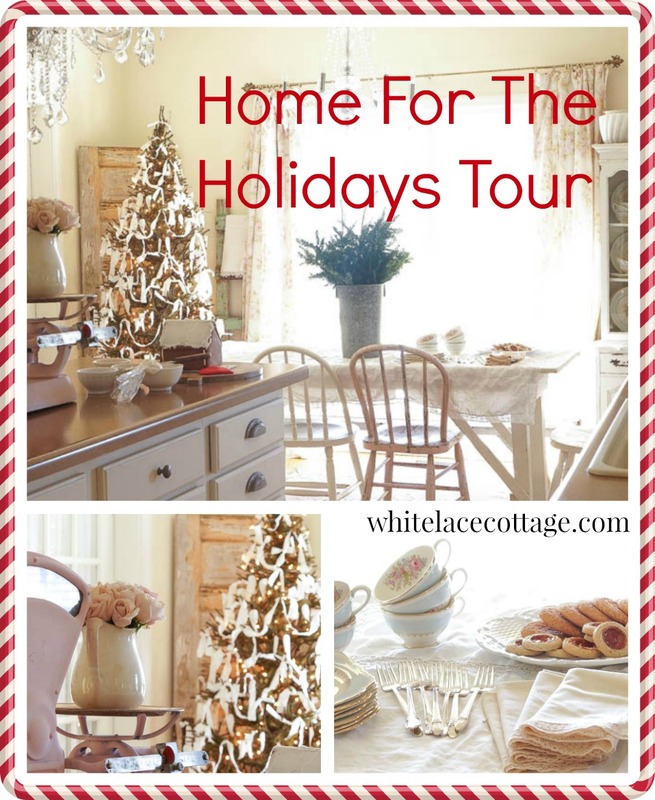 Love your tree… happy to be on this fun tour with you! Thank you so much Maryann! I am thrilled to be on this tour with you and so many other amazing creative people too! I love your Christmas kitchen Anne. It is lovely! I really love your sweet tree with the torn fabric garland. I too, have to be baking a lot of cookies this time of year. I don’t do much of it in the spring and summer, but go crazy at Christmas. I noticed in of your posts that you and I have the same pretty PiP studio pitcher. I love that thing!! !